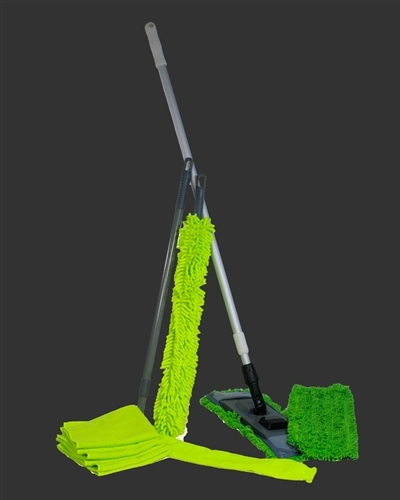 Clean your house faster and better with our “Gotta Clean My House Kit”. It’s all of our great household cleaners (microfiber mop, cloth & High-Duster Kit) in one package. These commercial grade household cleaners are designed for your every use: Mopping, Wiping, Cleaning, Dusting and More. Plus you save over $24 versus buying each of our household cleaners individually. The mops, cloths and dusting sleeves can be laundered over 300 times. That’s a real savings compared to buying disposable cloths and wipes. Our kit includes a Telescopic pole, a Pocket Mop Frame, 2 Microfiber Pocket Mops, a High Duster Kit and 3 Microfiber cloths.